By far my favorite book this year! Author Rinker Buck, his brother Nick and trusty Olive Oyl set out on a 200,000 mile journey to recreate the historic Oregon Trail migration. Each chapter is a blend of history and personal reflection that I found sincere but also laugh-out-loud funny! You don't have to know a thing about mules or wagon design to be enthralled by this inspiring and epic journey. 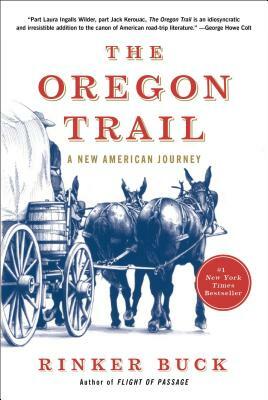 An epic account of traveling the length of the Oregon Trail the old-fashioned way—in a covered wagon with a team of mules, an audacious journey that hasn’t been attempted in a century—which also chronicles the rich history of the trail, the people who made the migration, and its significance to the country. But The Oregon Trail is much more than an epic adventure. It is also a lively and essential work of history that shatters the comforting myths about the trail years passed down by generations of Americans. Buck introduces readers to the largely forgotten roles played by trailblazing evangelists, friendly Indian tribes, female pioneers, bumbling U.S. Army cavalrymen, and the scam artists who flocked to the frontier to fleece the overland emigrants. Generous portions of the book are devoted to the history of old and appealing things like the mule and the wagon. We also learn how the trail accelerated American economic development. Most arresting, perhaps, are the stories of the pioneers themselves—ordinary families whose extraordinary courage and sacrifice made this country what it became.